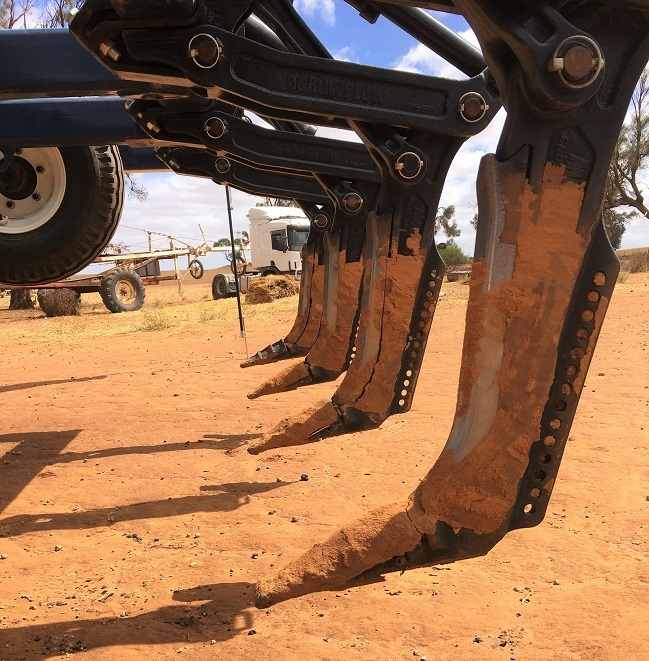 GRAIN growers are advised to understand the yield-limiting constraints of their sandy soils before undertaking deep ripping of paddocks ahead of the 2019 sowing season. While deep ripping offers potential to improve grain yields on compacted sandy soils, experts say it does not necessarily solve issues with all soil types. CSIRO senior research scientist Lynne Macdonald said it was important to target ripping practices to those sands where hard or compacted layers were the primary issue. “Where acidity, water repellency or subsoil toxicity are primary constraints, other amelioration practices may also be needed for the full benefits from ripping to be achieved,” Dr Macdonald said. Dr Macdonald said identifying and prioritising the key constraints on sandy soils could be difficult. Hard and compacted layers can be identified in sands by digging a pit and looking and feeling for changes in soil structure, using a simple push probe to feel for hard layers or by using a penetrometer. Soil moisture has a big impact on how hard the soil will feel, with most soils hardening on drying. Push probes and penetrometers should be used after significant rain when the soil moisture profile is full. This will help to avoid misleading penetrometer readings caused by lack of moisture alone. Dr Macdonald said the depth of hard and compacted layers varied across the sandy soil landscape. Ripping to depths deeper than necessary was very costly due to fuel requirements (for example, doubling the depth may quadruple the power needed). “It is important to look beyond the depth of rooting to identify how deep the physical constraint continues,” she said. Acidity-related constraints can stunt root growth, limit nutrient availability or lead to toxicity effects. Dr Macdonald said the full yield benefits of ripping were unlikely to be achieved if acidity went untreated. Threshold levels for soil pH (in water) are above 5.5 in the top 10 centimetres, and above 4.8 in the subsurface soil. Acid layers can occur in a relatively thin zone that prevents root growth, and can be missed by traditional 0-10cm soil sampling. Applying pH indicator dyes (available from hardware or gardening stores) can be an effective first step in identifying if there is an acid problem, and where in the profile it occurs. “Where pH falls below the threshold targets, a liming plan should be part of a long-term amelioration strategy,” Dr Macdonald said. Water repellency is common in sandy soils, leading to uneven soil moisture and poor establishment. Although providing some surface disruption in the year of implementation, most ripping practices do not provide enough surface mixing to overcome repellency for multiple years. 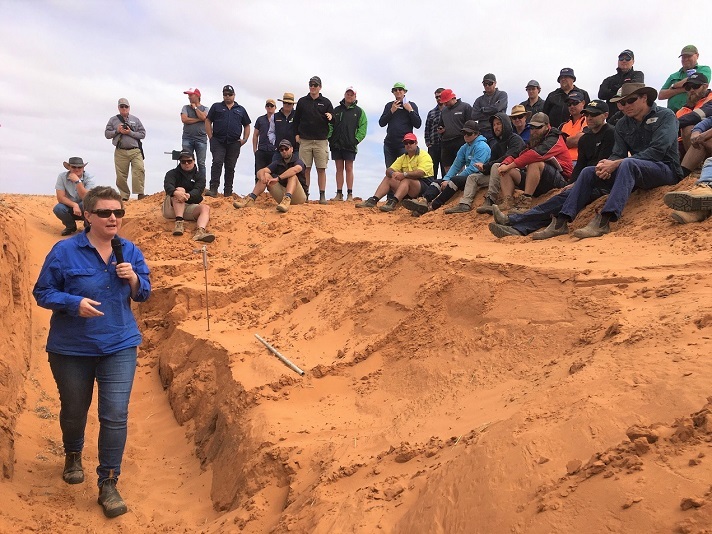 “Rather than ripping alone, repellency is better addressed through deep ploughing approaches that mix the repellent sand to dilute and/or bury the problem layer,” Dr Macdonald said. “Where available, clay can provide a permanent solution to overcoming water repellency. Specific delving and mixing tine designs are required to effectively mix the surface soil layers, and can be applied with/without claying practices to overcome water repellency. Dr Macdonald said subsoil toxicities and nutrient deficiencies exist within sandy soil landscapes in the southern region and can change rapidly with topography. A subsoil ‘health’ check can be useful in enabling growers to avoid areas where deeper rooting depth may not bring yield returns due to subsoil toxicities. “Ripping will loosen and soften the soil profile to depth, flattening and unanchoring standing stubble,” Dr Macdonald said. A successful ripping operation is likely to increase the potential of crops and pastures for several years and therefore management of ripped areas should be adjusted to match the new potential yield. “For example, without higher N inputs the crop yields may not fully respond to the benefits from deep ripping,” Dr Macdonald said. More information on deep ripping can be found in the GRDC’s Deep Ripping Fact Sheet, http://bit.ly/2UnEJV7. Information on subsurface compaction is available via the Soil Quality website at http://bit.ly/2FPgirx.